Did You Forget to Plan? Hopefully, at this point, you have some idea of what gifts you will buy. If not, make a plan and a budget now. You will spend more money if you go to the mall or get online without a plan, especially if you are rushing into a store on Christmas Eve. Don’t be distracted by what seems like a good deal. Stick to your list. And go ahead and purchase a couple of extra gifts in case you forget someone. 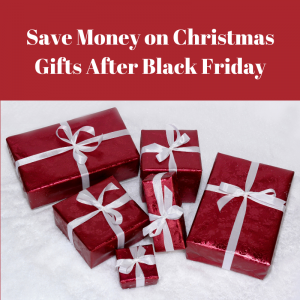 We hear a lot about Black Friday and Cyber Monday but you have two more important shopping days that can save you money. Both of them are online days. Green Monday is the second Monday of December and it is significant for online shoppers. This is the last Monday you can purchase your presents and be sure they will arrive by Christmas Eve. Green Monday falls on December 10 this year. Retailers know a lot of last-minute shoppers will be looking for deals online and many will offer discounts. Waiting until Green Monday is a risk if your package gets lost but you could save some money. Shoppers who want to procrastinate a few more days can take advantage of free shipping days. Again, retailers will offer some discounts because they know shoppers will be online. Remember many retailers offer free shipping anyway so you might not want to wait. Some retailers – large and small – will post special deals on their social media pages. Follow your favorite stores on social media and also follow stores like Etsy that sell unique handmade goods. Some of the deals are for a limited time so be prepared to act fast. Put some money back in your pocket by using your reward credit cards even if you have the money to purchase the gifts. Simply pay off the balance on your next bill to avoid the interest fees while still getting the rewards. Rack up the points on your store loyalty cards during the holiday season. Many retailers have these cards that allow you to get free stuff. Kroger quadruples fuel points on purchases of gift cards through December 11. Make sure you read the fine print and make sure your purchases qualify. Have you finished your holiday shopping? What are you doing to save money? Let us know in the comments below. Yes, I agree on this point Green Monday is the big saviour for last time shoppers. Thank you for this easily read guide, I am glad to inform you that I have decided to take into your advice and implement it. Previous post: Why is Money Lending so Famous?